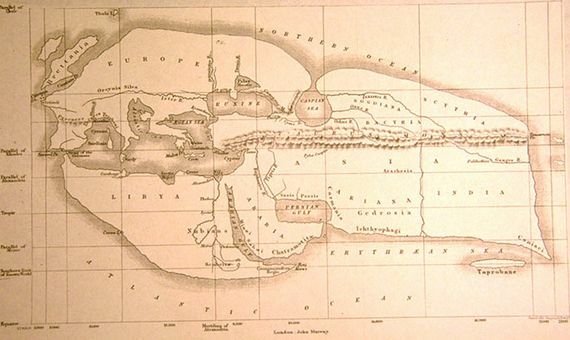 Some 1,700 years before the famous expedition of Magellan and Elcano, which took more than three years to circumnavigate the Earth to verify that it is not flat, but round, the Greek polymath Eratosthenes managed to make that same finding and also estimate its diameter with a straight-forward piece of mathematical reasoning, without leaving the city of Alexandria and with surprising accuracy. The power of the mathematics developed by the classical Greeks was the key to performing this remarkable feat and managing to measure the impossible. Eratosthenes was born in Cyrene, a city located in modern-day Libya, around 276 B.C. and in the year 236 B.C. became Chief Librarian of the prestigious Library of Alexandria. He made contributions in fields as apparently disparate as poetry, philosophy, mathematics, astronomy, history and geography, among others. As a mathematician, he is well known for the so-called Sieve of Eratosthenes, which makes it possible to isolate and determine all prime numbers up to a given natural number and which is still used today. 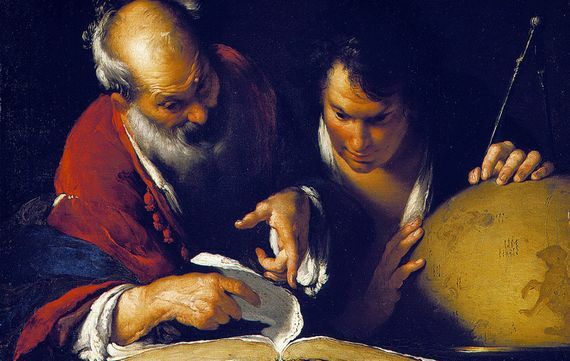 In addition, he knew how to apply basic mathematical knowledge, such as the calculation of the length of an arc of circumference—which is now studied in secondary school—in order to approximate the radius of the Earth very precisely, using only rudimentary instruments. In particular, Eratosthenes observed the shadow produced by the rays of the Sun during the summer solstice in two places far enough away from each other: Siena (now the Egyptian city of Aswan) and Alexandria, located north of Siena following the same meridian. In the solar noon of that day, in a deep well of Siena, one could see for a very brief instant the reflection of the water it contained, which showed that the rays of the sun fell perpendicularly. This is true at the time of the summer solstice and on the Tropic of Cance (Eratosthenes placed Siena on that terrestrial parallel) However, at that same moment, in Alexandria (located about 7 degrees farther north) the rays fell at a slightly transversal angle, since obelisks or a simple cane stuck in the ground cast a small but perceptible shadow. This is already in itself a simple proof that the Earth cannot be flat, because if it were so, at that same moment in Alexandria the solar rays should also have fallen perpendicularly and not provided any shade. Eratosthenes started from a model of a round Earth in the shape of a sphere, so he knew that the curvature of the Earth would cause this effect. He devised a method to calculate the diameter of the sphere from only two data points: the angle of incidence of the sun in Alexandria on the summer solstice (which is the same as the section of the circumference defined by the two cities) and the distance between them. In this way, with a simple rule of three he could calculate the length of the circumference of the Earth. If the angle of incidence gives rise to a length of an arc of circumference equal to the distance between Alexandria and Siena, then the total length will correspond to 360 degrees (the full circumference). To calculate the angle of incidence of the sun’s rays in Alexandria on the summer solstice he had to use trigonometry concepts, which were already known to Greek mathematicians, although using methods very different from those used today. In current terminology, that angle of incidence is the value of the arctangent of the division between the shadow of an object and its height (see Figure 2). Eratosthenes obtained a value close to 7.2 degrees, or 1/50th the circumference of a circle. To finish his calculation he needed a sufficiently accurate estimate of the distance between the two cities. Legend has it that Eratosthenes knew that a camel took fifty days to get from one city to another, traveling about a hundred stadia per day, so he estimated the distance at about five thousand stadia. The precision of his calculation is unknown, since the stadium is not a unit of measurement with a clear value. But if we consider as a measure of a stadium the one corresponding to the Egyptian stadium (157.5 metres), we would obtain an approximate distance of 787.5 km. Substituting these values ​​in the rule of three above, we obtain a circumference length of 39,375 km. This is an excellent approximation of the actual value, which is about 40,075 km at the equator. Eratosthenes had a model of the Earth and the solar system that was quite successful. Even though he made a series of assumptions that are not entirely accurate (the Earth is not a sphere, the sun’s rays are not parallel, Siena is not directly on the Tropic of Cancer…), by combining modern capabilities with this same technique, a result extremely close to the real one can be obtained. Nowadays, this value is estimated using satellites and geolocation systems. These precise measurements allow us to detect even small modifications (of centimetres) on the surface of the Earth. However, many centuries before, with hardly any technology, using the ingenuity and mathematics developed by their predecessors (Pythagoras, Archimedes, Euclid, Thales of Miletus…), other classical Greeks made amazing calculations, such as calculating the distance from the Earth to the Sun, predicting eclipses and the movement of known planets, and even proposing that the Sun was the centre of the Universe and not the Earth, as did Aristarchus of Samos. With these advances, they went beyond experimental knowledge, based only on direct measurements, to a much more ambitious conception of scientific knowledge, which allowed us to know things beyond our own immediate perception.